I’m in the new house, which is pretty awesome. Not awesome is the fact that, two days into living here, I came down with a tummy bug. So… we have hundreds of boxes to unpack, but I’m stuck in bed. And the worst is, I have to wait another FOUR HOURS to see the doctor. Anyway. I guess being bed-bound has its advantages. Namely I might actually have time to write an entry for WRiTE Club. Which is why this post will be a short one. I’m going to utilize my time to write. Will hopefully be back tomorrow with something more substantial. Who else signed up for WRiTE Club? Have you submitted anything yet? Firstly, I would like to thank Misha, for inviting me to appear on her blog. It’s an honor and a pleasure to be here. Misha is one of the first few bloggers I met online. Inspiration is one of my favourite topics, as I need to constantly inject myself with mega doses of it. We writers are susceptible to feelings of despair and insecurities, courtesy bad reviews, rejection from agents and unfavourable comments from crit partners and beta readers, in this scenario we have to constantly motivate ourselves and be our biggest supporter. An unshakeable faith in our abilities and stories is a prerequisite. Just because a few agents passed on our projects doesn’t mean that we are bad writers. It’s just a case of different tastes. One of my favourite saying, is the one by Ralph W. Emerson, “If I have lost the self-confidence in myself, I have the Universe against me.” This applies not just to writing, but to every creative person, be they singers, dancers or painters. It applies to us writers perfectly. When we lose confidence in ourselves, our stories and our characters, not only are we doing a grave injustice to ourselves, but we are also cheating ourselves. We are not just writing, I feel we writers are taking dictation from God. It’s He who wants us to tell the unique stories that reside in our hearts. Rejections and criticisms should not deter us, infact, they should strengthen our resolve to tell the best story that we can. We should strive to turn our detractors into our biggest supporters. There are ways we can motivate ourselves. I am a published author, struggling to get an agent, and get my new books published. Whenever feelings of despair accost me, I open my cupboard and pick up the author copies of my first few books. I tell myself that, “if I can do it once, I can do it again.” This fills me up with renewed enthusiasm to get back on the publishing bandwagon that I had temporarily abandoned. We should have the belief that there is someone out there, maybe in a remote corner of the world, waiting to be inspired by our words, waiting to be entertained by it, waiting to bond with the characters. Do we have a right to deprive those people of inspiration, entertainment or bonding, because of our low self-esteem? Even if our words motivate and inspire only a handful of people, or entertain the same number, isn’t that much more than what we hoped for when we typed that first word. So, don’t let anyone stop you from writing as you never know who you will Inspire with your story. Thank you Misha, for giving me this opportunity to talk about inspiration with your readers. Rachna Chhabria has a Bachelor of Arts Degree in Psychology, Literature and Journalism. She is the author of The Lion Who Wanted to Sing and Bunny in Search of a Name. Several of her stories have appeared in Penguin Anthologies. She teaches Creative Writing in college. She lives in Bangalore, India. Hi! So sorry about disappearing again! Was busy packing up my house for our move, so will be back on Monday, if everything goes to plan. GPF will continue as usual. Hi everyone! Welcome to another installment of Interview Tuesday. Basically, I spent a few hours talking to a lot of authors about all sorts of stuff, from guardian teddies to writing methods. Today’s author is Sydney Aaliyah. Without further ado, here’s our chat. Please note: This interview was done in May already, which explains why we’re talking about JuNoWriMo. Hey Sydney. Welcome to my blog. Please tell us all a bit about yourself? I grew in Dallas, Texas. I have been living in Shenzhen China for the past 5 1/2 years. I helped create and manage a Golf Academy here in China. I graduated from Florida State University with a BS in Criminology and Psychology. I have a law degree from from Georgetown University Law Center as well. I practiced law for about 9 months before I discovered that it wasn’t what I wanted to do. I basically sat in a room with no windows for 12 hours a day with 15 other people. Not the job for me. I really enjoy traveling and am fortunate to have had the opportunity to travel to 15 different countries. I have been journaling and writing stories every since I can remember. I am single. I have two older brother and three nephews who I love to death and miss them terrible being here in China. So what sort of stories do you enjoy writing? I enjoy writing chick lit. My stories are about relationships, but not really romance. I tend to write about female characters that have stronger confident outer personalities, but inside they have issues. I also enjoy writing legal thrillers as well. I think that is more so I don’t feel like my law degree was a total waste. I have a ton of short stories over the years that I have written where the female character is a singer or a entertainer of some kind. someone who is in the public eye. Those are fun because I can live vicariously through my characters because I can’t sing and getting in front of a big crowd to do anything scares me to death. So how did you get into writing after studying for such different directions? I have always had a journal going and it is filled with different story scenes, dialogue exchanges, character sketches and plot summaries. All the things that I have recently learned that goes into plotting our outlining a novel. I have a lot of these different parts, I just have never put them all together into one story or novel. I am at this point in my life that I am tired of working for other people and spending so much time doing what I have to do out of necessity. I really want to get into doing something I love. Writing is something I love to do. I have a pretty high stressed job at the moment and often times I get pulled in a bunch of different directions. Right now, writing allows me to be still and be focused for a couple hours per day doing something I love. So, I would say it is keeping me sane right now. Writing keeps me sane as well. Do you have a fixed writing routine or do you write when you feel like it? I have been working on creating a schedule over the last month. I typically work 6 days a week from 8:00 am to 6:00 pm at my paying job. Sunday I work on getting organized for the week. Plan out my blog posts, find out what I have to get together for my WIP and usually spend about four hours total on that type of stuff. I am currently outlining and getting prepared for JuNoWriMo next month. I work on it from 7:00 pm to 9:00 pm every night about 4 days a week. The am trying really hard, but without much success to limit my twitter time to an hour per day. Since I spend so much time at work, I can usually carve out an hour or two while I am on the clock and gets some work done there as well. Typically that is when I will catch up on the blogs that I follow. It all just depends on what kind of day I am having at work. With a goal of 1,667 words per day next month for JuNoWriMo, this could all go out the window. I will have to see. I am very much a planner and a list maker. It is the only way I can function. Is JuNoWriMo your first major attempt at finish a project? Yes. The first novel. The goal is 50,000 words in one month. I haven’t every written anything of that length before. I competed in the A to Z blogging challenge in April which got me in the habit of writing something every day. I did pretty good and finished on time, but it really just taught me that preparation is key. So, I have been spending all of May outlining and prepping for JuNoWriMo. But, I have no idea what I am in for. I am looking forward to it. I keep having this nightmare that I sit in front of my computer on June 1st and can’t figure out the first sentence. I sit and sit and sit and can’t pull the trigger. So, I come back the next day, sit in front of my computer and again, nothing. I think I am going to write that first sentence before June, so my nightmare doesn’t come true. HAHA. So what have you done to prepare for JuNoWriMo? I have been reading Outlining Your Novel; Map Your Way to Success by K.M. Weiland. She is a real advocate for mapping out your novel before you get to the writing part. She talks a lot about finding some of the issues and problems with characters, plots and time lines in the story before you get to the actual writing part. Which I love. Saves a lot of time in that sense. It doesn’t make the task of writing easier because you still have to do it, but gives you tips on how to focus your writing more. I am also trying to get my schedule figured out right now. I have been trying to do some daily writing with the word goal in mind. Trying to determine in the perfect conditions, in the writing zone how much time do I need to write 1,667 words that actually resemble a story. I am also asking for any and all advice on how to tackle this month. Especially from others who have done it. Hahahaha I wouldn’t be able to help. I’ve failed at both my attempts at NaNoWriMo, so… What gave you the idea for the project you’ll be writing for JuNoWriMo? No worries. I signed up for NaNoWriMo last November and opened up a nice blank document on November 1st and that is as far as I got. HAHA. The novel I am starting in June is about a single women from America who currently lives in China (the similarities to my life end there. I promise. haha). She goes on a business trip to America and mets a guy. It is a story about everything that she has to do to get back to the states to be with him. What I like best about the story is that the lead character has some internal issues to deal with and a female boss who puts some crazy emotional obstacles in the way of her goal. The boss character is crazy insane. I have thought about this story for about two years now. I am excited that I finally explored the idea further and am ready to write it. Awesome. What have you found to be the greatest challenge to writing so far? I think the biggest challenge is just finding the time. Finding the right balance. In my perfect world, I could quite my job and write all day every day. And, those student loans just disappear. But, reality is I have to have a job. I am actually looking forward to seeing what challenge I run into writing something of this length. Like, will I stick with the outline or go in another direction when I get into? What things will work and won’t work? And, I am sure there are a bunch of other challenges, but I just refuse to think about them at this time. haha. So what do you enjoy most about writing? I enjoy the processes. From idea, to research, to outlining, to writing, to editing. Actually, I am learning to loving editing. I enjoy the idea of having a thought in my head actually turn into a story on paper. I like when the emotions I felt from that idea come across in the actual written story. I also have really enjoyed the writing community that I have meet online. Everyone is so supportive of each other and wants to help each other succeed. That is great to be around. So which phase is your favorite and why? I like the first draft writing phase the best. It is the anything goes phase. I love when I get in a zone and just put it all out there. I sometimes go down a tangent that I didn’t originally plan, but I am flexible enough with my outline process that if its good and it has a place in the story, I will keep it. Even if it doesn’t quite make sense, I will go back and rework it to make it fit. I am learning to appreciate the editing phase just in the sense that you actually see your story getting better. My issue with it is if I don’t have deadline, I will edit and edit and edit and edit. I participate in the Writer Wednesday Blog Hop where every Wednesday we get a photo and 5 words to use in a story with a 500 word limit. I write the story on Thursday and Friday and know that I have 4 more days to edit it. I will look at it for a short time every day, but Wednesday comes along, I just put it out there because times up. But, with no deadline, I have three short stories right now in my edit file and I can’t let them go, yet. Finally: Where can people find you on the social networks and blogosphere? Thank you very much for this interview, Sydney. How did JuNoWriMo go? Anyone else do JuNoWriMo? Who’s doing NaNoWriMo? I just decided that I needed to stretch my writing, and I stumbled onto DL Hammon’s blog post announcing WRiTE club. Naturally I entered. It’s a great way for my writing to gain exposure without my name necessarily being out there with it. 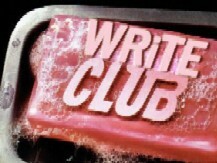 The best thing: the winner of WRiTE club 2012 will be picked by an excellent line-up of judges. But what are you still doing here? Go check it out! When Misha suggested I write a post with the theme, inspired, I knew exactly what I wanted to talk about. Finding inspiration. It’s something all of us struggle with from time to time. Inspiration is so important because it helps move us forward. It’s something every one of us struggle with from time to time. Life’s difficult and busy and we don’t always have the time to enjoy the good things around us. Occasionally, inspiration will just hit us. But that’s not the norm. Often, it’s the product of hard work or just being in the right place at the right time. But the truth is, it shouldn’t be that way. Every one of us is surrounded by people and things that have the potential to inspire us each and every day. The world is full of beauty and detail that should thrill and inspire us all the time. Even people in awful circumstances can find happiness and joy in the small, positive things around them. The problem is that we spend so much time stuck in the same places, we often learn to tune out what’s around us. Sometimes the easiest way to find inspiration is to go somewhere new. Simply taking a short trip or even visiting another city for lunch can open us to all kinds of new experiences, and new inspiration. When we come back home, it’s often even easier to see the good things that were there all along. Plus traveling can open us up to new opportunities and experiences, all with the potential of adding inspiration to our lives. We can learn and grow and become better people because of it. Even if you don’t have the opportunity to go somewhere, you can still make a conscious effort to try to see the world around you in a different light. Try looking around the room you are in right now. I bet you can find at least three beautiful or inspiring things if you try. Just make an effort to see something worth while. Inspiration is all around us. Sometimes all you have to do is open your eyes and look. Thanks so much for this sweet guest post, Alyson! So, ladies and gents, where do you find your inspiration? Also, do you want to do a GPF this year? The spaces are running out, so if you are interested, please check this out and contact me. The following dates are still available: 17 August, 31 August, 28 September, 12 October, 19 October and all the Fridays in November.